Don't hesitate to call the vet if your cat has trouble seeing. The retina is all that stands between perfect vision and complete blindness for your cat. This thin film is connected to the back of eye, where it transforms information into electrical signals for the brain to process. Retinal detachment invariably causes vision loss, but surgery can sometimes repair the damage. Your vet can't effectively treat a detached retina until he figures out why it happened in the first place. A physical injury, inflammation or infection could be to blame. 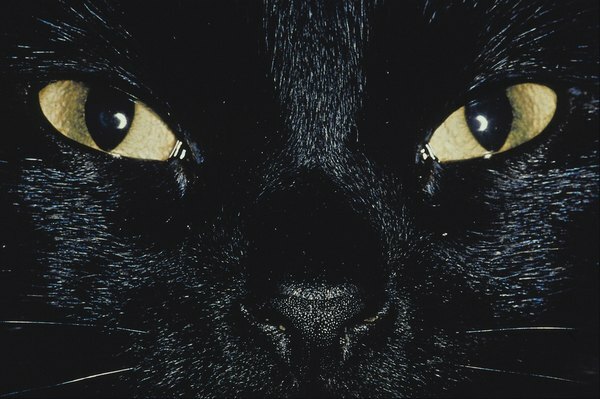 The feline retina is often separated from the eye by fluid that builds up underneath it. Your cat may have a hole or tear between her retina and eye that lets fluid in or the buildup could be the direct result of an infection. Previous eye surgery, particularly cataract removal operations, can cause unintended damage that increases the chances of retina problems, according to Veterinary Vision Animal Eye Specialists. Even if you spend a lot of time staring into your kitty's loving eyes, you may not notice that her retina isn't where it should be. That's why you should schedule a vet appointment if your furry friend is having a hard time getting around. If there is a problem with the retina, your cat's vision will be worse than normal. She may be more cautious as she moves around and you may also see her bump into furniture. She may also squint her eyes slightly to compensate for her poor vision. Your vet can diagnose this problem in a matter of minutes by examining your pet's eyes with a opthalmoscope or conducting an ocular ultrasonography, according to The Merck Veterinary Manual. There are several surgical options for treating your cat's detached retina. Cryotherapy, which involves freezing a small portion of the eye, as well as laser treatment are used to close an existing tear that is letting fluid behind the retina, according to the Furry Critter Network. If the retina has shifted out of position, the vet may sew a thin belt of silicon around it to keep it in position. This operation is called scleral buckle surgery. Alternatively, your veterinary surgeon may conduct a ignipuncture to cauterize a part of your cat's eyes. Cauterization sounds brutal, but it is an effective treatment in cases that require immediate attention. Cats regain their vision over the weeks following this surgery, but their vision may never completely return to normal. Your vet will recommend the surgery that is appropriate for your cat's unique situation. Not all cases of retinal detachment have a happy ending. Detached retinas are the second most common cause of blindness in felines, according to Cornell University College of Veterinary Medicine. Luckily, vision loss is not a life-threatening disability. Prompt treatment increases the chances of your cat making a full recovery, but that doesn't mean it's guaranteed. As long as you love and care for your pet no matter how bad her vision gets, she'll continue to live a happy and fun-filled life. If your cat ends up losing some or all of her eyesight, ask your vet to recommend strategies for living with a blind animal. Since she won't be so good at jumping and running, you should keep dangerous and sharp objects stored safely where she can't reach. Can a Cat Be Color Blind to Red?